HCMC hopes to cooperate with Thuringia state of Germany in vocational training and in improving the quality of tertiary education, HCMC Party Chief Nguyen Thien Nhan said in his reception for the state’s Minister-President Bodo Ramelow. Nhan said the visit of the German state’s leader in the context of positive developments in Vietnam-Germany ties will open up new opportunities for cooperation between localities of the two countries. He went on to say that HCM City is also eager to work with Thuringia in such areas as transport infrastructure, and AI solutions to solve problems in urban development. 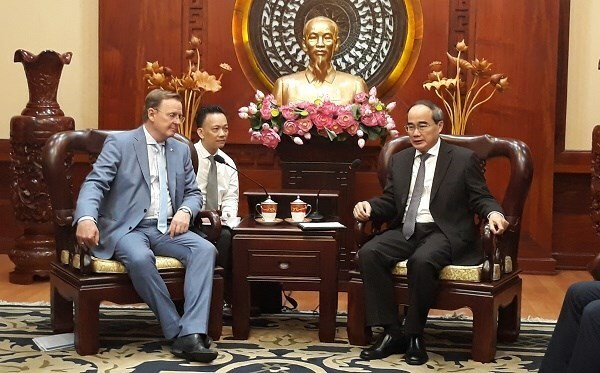 Bodo Ramelow told his guest that the participation of representatives from 70 firms, universities and research institutes in Thuringia in his visit demonstrated their interest in cooperation with Vietnam, including HCM City. He noted that the two sides could also work together in high technology, water management, trade and SMEs. According to the official, there are 240 Vietnamese students in Thuringia, and the state hopes to receive more students from Vietnam.